Key difference: A quiz contains multiple type questions, which are supposed to be responded to instantly, while a questionnaire is a set of questions with choices of answers, especially taken for statistical analysis. “a test of knowledge, especially as a competition between individuals or teams as a form of entertainment”. 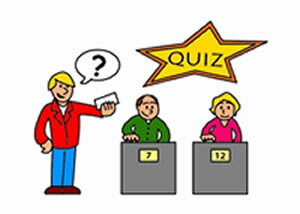 Generally, a quiz contains multiple types of questions, which are to be answered instantly. They are small tests, which include questions of general and updated versions and are replied instantly. They can be formal or informal, and are commonly conducted at school and college levels in order to check the individual’s responsiveness and intelligence. They are usually in the form of a game, a type of mind sport, in which the players (as individuals or in teams) are supposed to attempt to answer the questions correctly. They are also brief assessments types used in education fields to measure the growth of one's knowledge, abilities and skills. “a set of printed or written questions with a choice of answers, devised for the purposes of a survey or statistical study”. They are sets of questions which are to be answered by attempting to choose an option from the multiple options provided for each question. Generally, they are research type of questions, which are conducted for statistical analysis. Questionnaires are a standardized form of research instrument used to collect the data from the respondents about the particular topic. It is a method used for collecting the data from a set of written questions which collects the responses from the client. 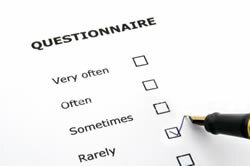 The questionnaire may be self-administered or group-administered. It is a short written or oral test; which are less formal than an examination. It is a data collection method in which participants read and answer questions in a written format. It gives information about the individual’s knowledge and responsiveness. It gives information about the individual’s knowledge and details of the content. They are to be responded to instantly. They may take time for responses. Here the options may be given or may not be given. Here the options are compulsorily given. They are generally in the format of a game or multiple choice questions. They are: Open Format Questions and/or Closed Format Questions.